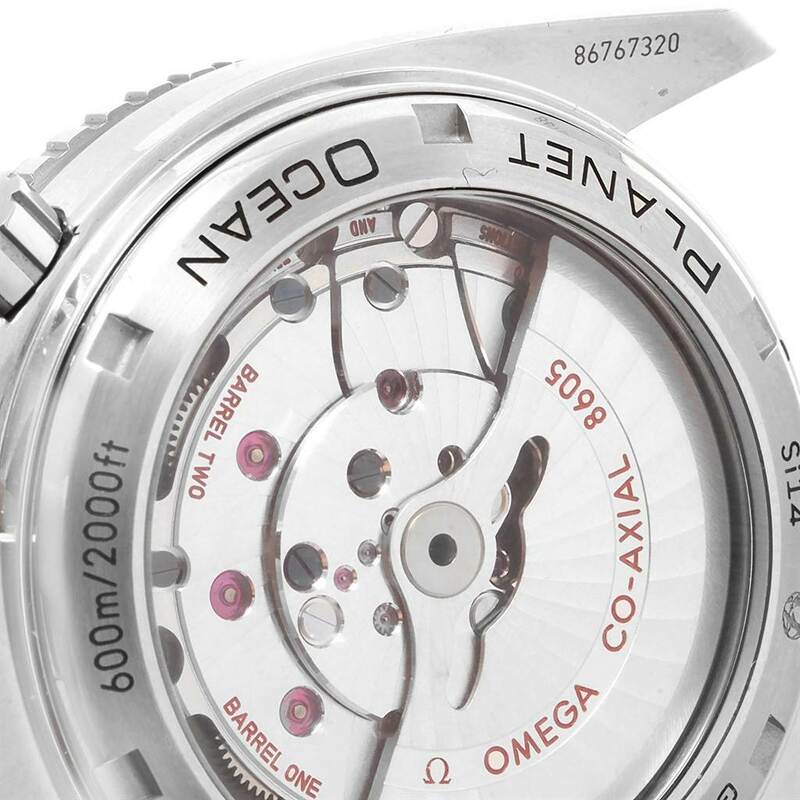 Automatic self-winding chronometer movement. GMT with time zone function. Silicon balance-spring on free sprung-balance, 2 barrels mounted in series, automatic winding in both directions. Rhodium-plated balance bridge and oscillating mass, luxury finish with exclusive Geneva waves in arabesque. 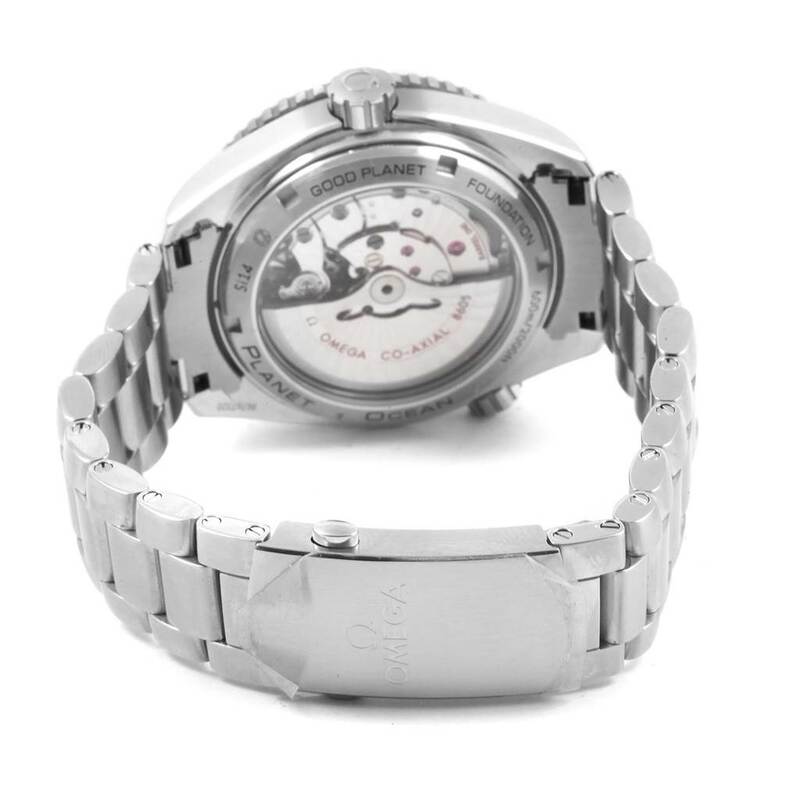 Stainless steel round case 44 mm in diameter. Helium Escapement Valve at the 10 o'clock position. Transparent case back. 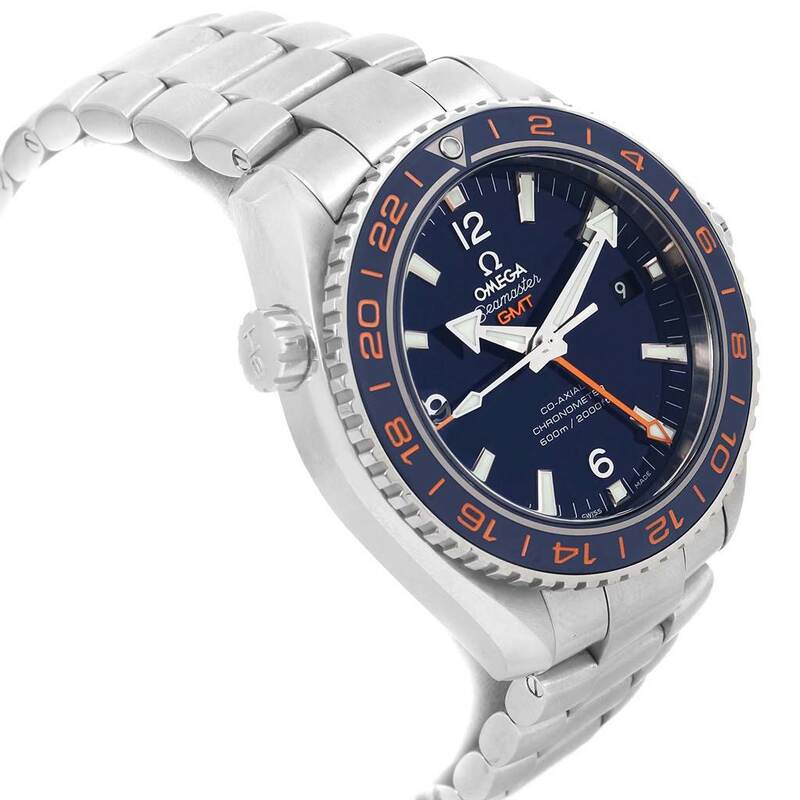 Blue ceramic uni-directional rotating bezel with bright orange GMT scale. 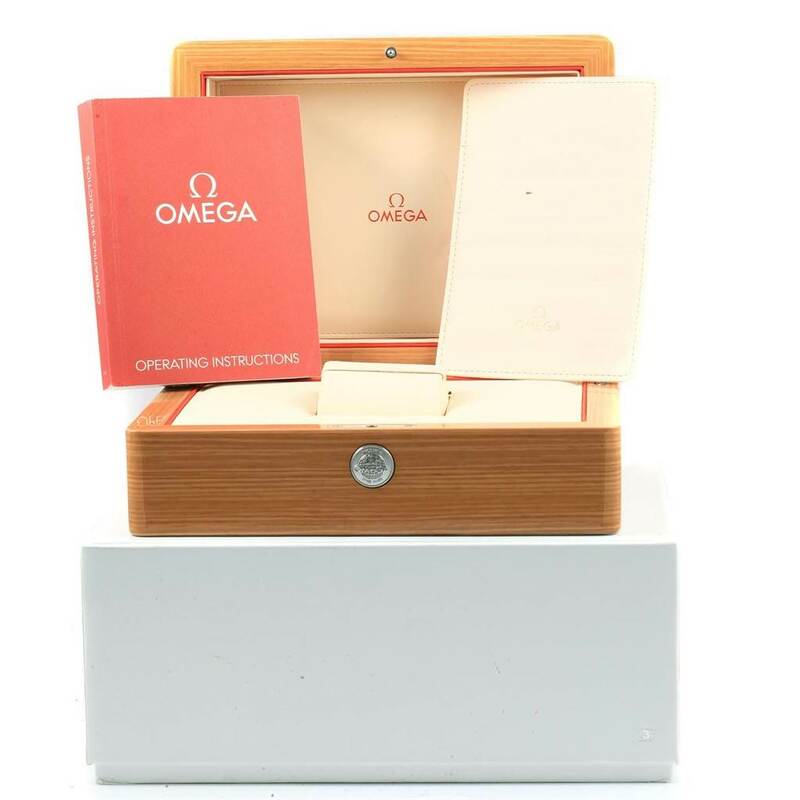 Domed scratch resistant sapphire crystal with anti-reflective coating. 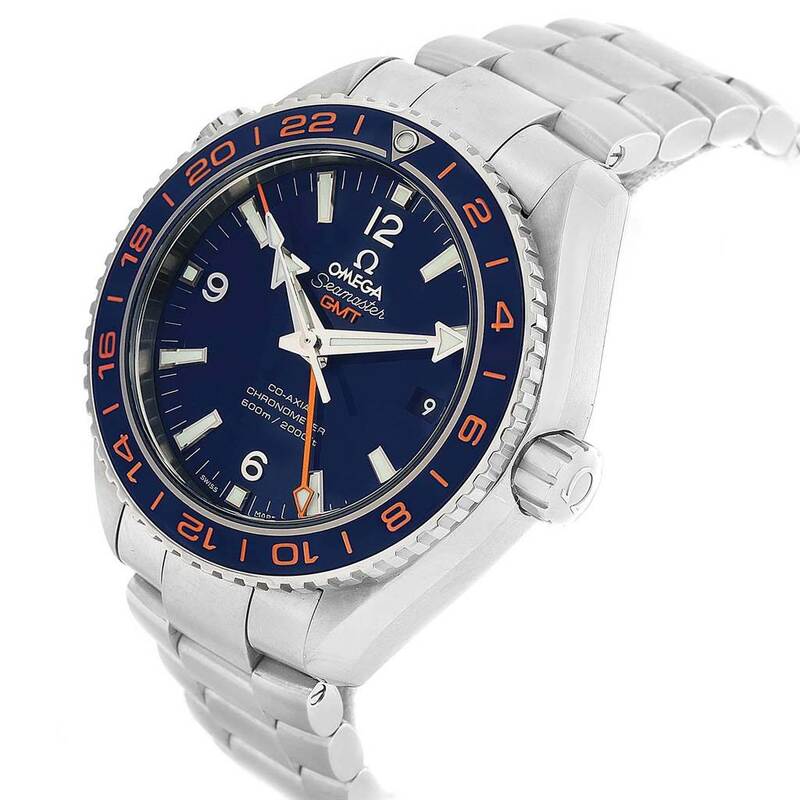 Blue dial with luminescent index hour markers and broad arrow hands. Silver arabic numerals at 3,6,9 and 12. Date calendar window at 3 o'clock aperture. Bright orange aluminum GMT hand. 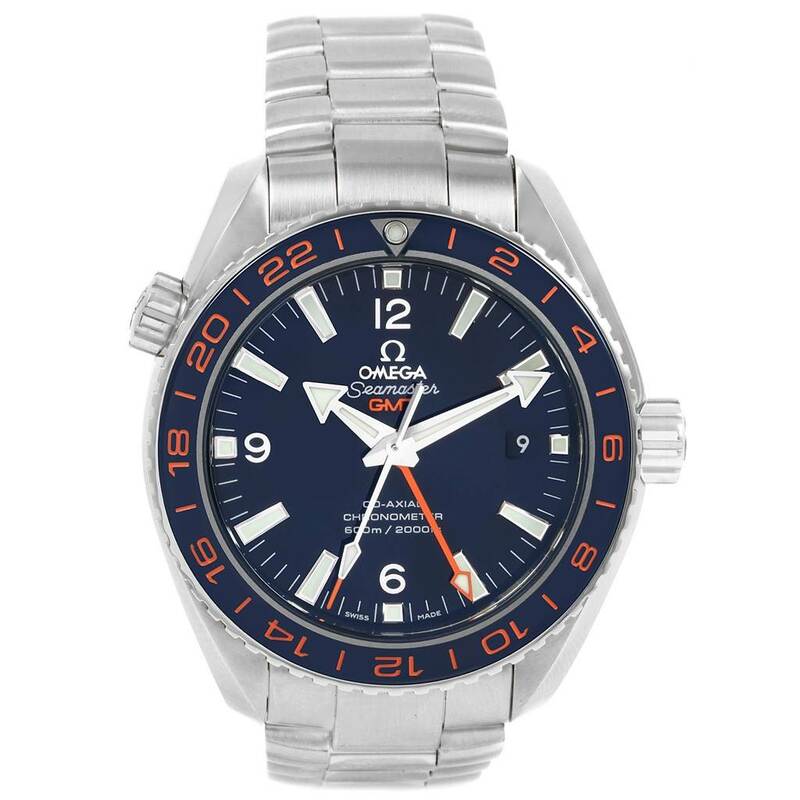 Omega Seamaster Planet Ocean GMT GoodPlanet Watch 232.30.44.22.03.001. Automatic self-winding chronometer movement. GMT with time zone function. Silicon balance-spring on free sprung-balance, 2 barrels mounted in series, automatic winding in both directions. Rhodium-plated balance bridge and oscillating mass, luxury finish with exclusive Geneva waves in arabesque. 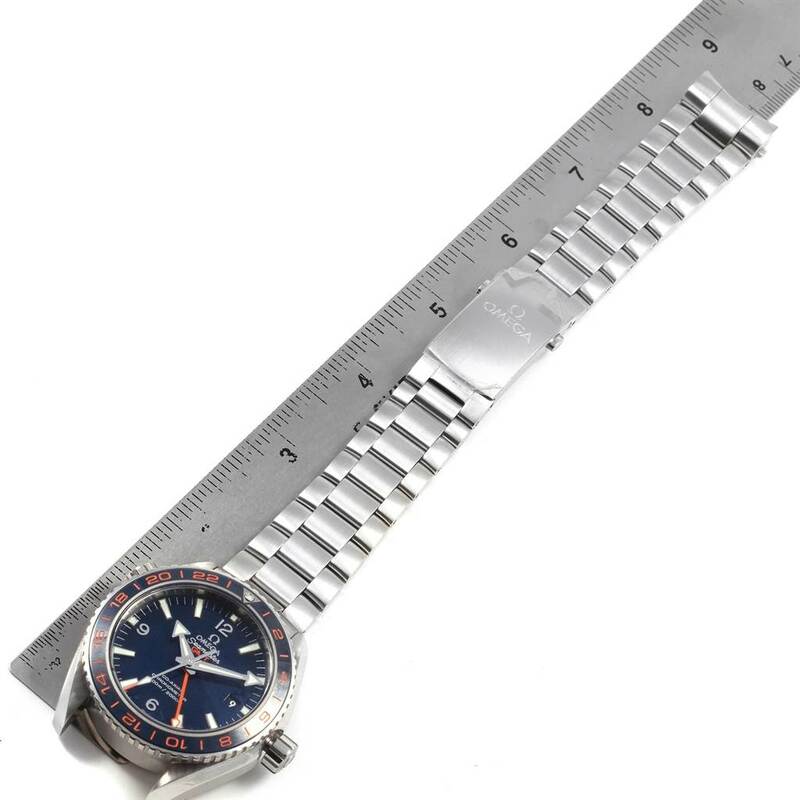 Stainless steel round case 44 mm in diameter. Helium Escapement Valve at the 10 o'clock position. Transparent case back. 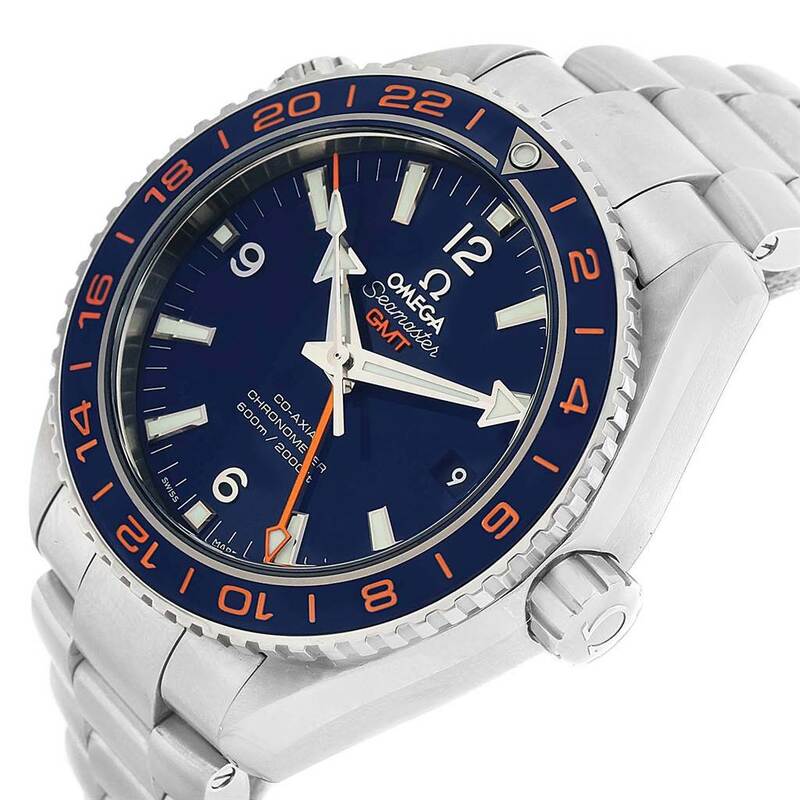 Blue ceramic uni-directional rotating bezel with bright orange GMT scale. Domed scratch resistant sapphire crystal with anti-reflective coating. 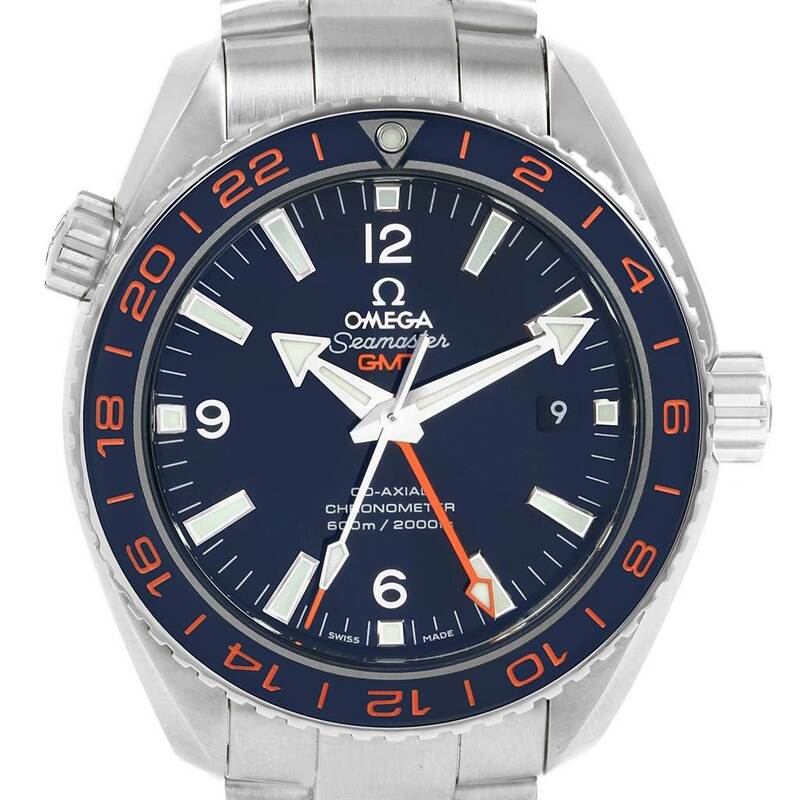 Blue dial with luminescent index hour markers and broad arrow hands. Silver arabic numerals at 3,6,9 and 12. Date calendar window at 3 o'clock aperture. Bright orange aluminum GMT hand. Stainless steel bracelet with deployent buckle. Fits 8.5" wrist.